Renovating is exciting & challenging, especially when it comes to costs but while you can do work yourself to save, not using a Licensed Electrician to do electrical work is not one of these jobs, as it requires you to meet certain legal and safety standards that require certification. So what electrical work can you do and when should you call an Licenced Electrician? You can carry out any electrical work that does not require you to touch the wiring in your home. If you have to plug in equipment, or the equipment is battery operated, you can carry out this type of work. You can also make holes in walls and in benches to fit appliances such as ovens, and air conditioners, but you cannot hardwire these to a power source. If you carry out wiring work to a source of energy yourself, you may be fined. Penalties in Australia for individuals are around $55,000, and $110,000 for a company. It is illegal and dangerous for you to carry out any electrical work that needs to meet Australian standards or wiring rules that are legislated by the government to prevent any serious accidents or possible death. Therefore, installations in your home that require wiring electrical equipment to a power supply will need to be fitted by a certified and licensed electrician. A licensed electrician carries public liability insurance, and they are qualified. So before you hire an electrician, ask to see their credentials, confirming they have a valid licence, as this will cover you against any damage if anything goes wrong. Rewiring – if your home is heritage listed or older than 20 years, it may be time to think about rewiring. Rewiring is necessary if the wires in your home become worn and don’t operate as well as they should. An electrician has the tools to locate wiring problems quickly and fix these. Installation of hardwired electrical appliances – if you want to install a pool, spa, oven or air-conditioner, an electrician can do these jobs fast and efficiently, with minimal disruption to your household. Connecting sheds to power – an electrician understands how much power can be drawn from a source at once, without causing significant problems to other areas in your home, such as power outages or fires. 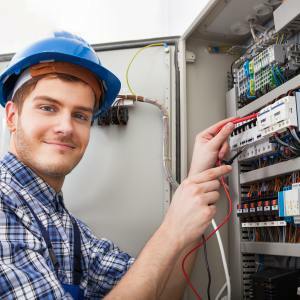 Call Austec Electrical and we can assist with your home renovation electrical work. Ask us for a quote and save.